On a day with heavy rain, I was approaching Stoclet Palace in Brussels. As an Art Nouveau and Art Deco enthusiast, this was a dream come true. 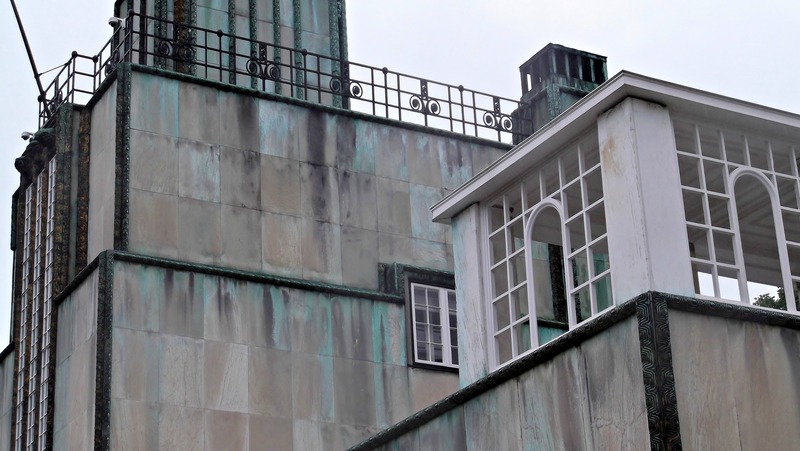 Palais Stoclet is one of the most famous private mansions built in Art Deco style. 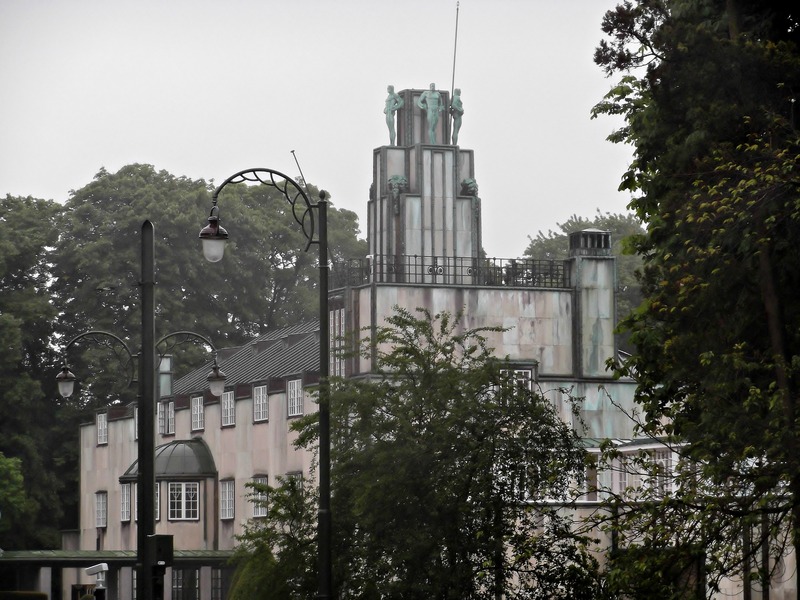 It was designed by the Austrian architect Josef Hoffmann between 1905 and 1911 for the entrepreneur and art lover Adolphe Stoclet. It is a UNESCO World Heritage Site since 2009. Josef Hoffmann belonged to the Vienna Secession (Wiener Secession) movement, whose members were unified in their opposition to Historism, the dominant art and architecture style of the second part of the 19th century. Historism is not a genuine style in itself, its main characteristic was that everything from older periods was mixed up and copied. Art and architecture that begin with the prefix ‘Neo-‘, as Neo-Baroque, Neo-Classicism and so forth, is likely to stem from this period. The Vienna Secession is said to have been the beginning of the Art Deco style, which is related to Art Nouveau. 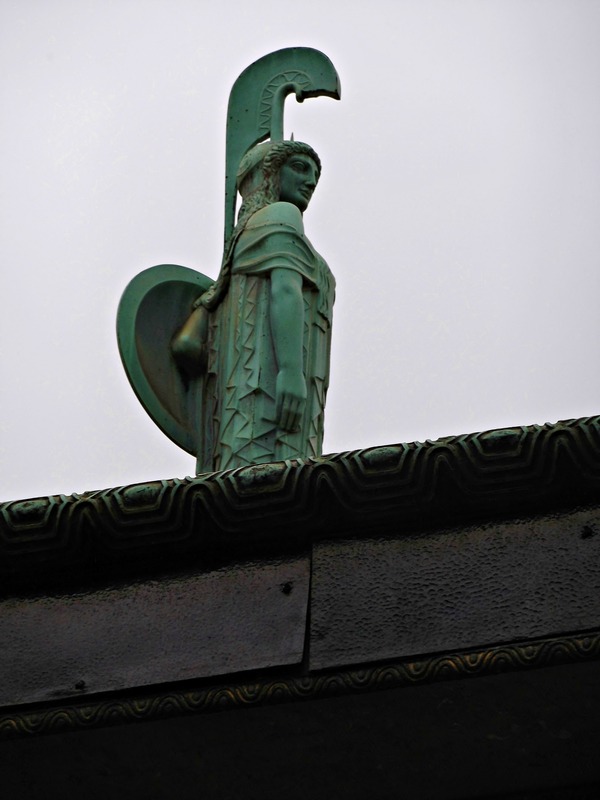 But it differs from Art Nouveau in that it uses more geometric forms. It is less playful, and prefers more stylized organic shapes. According to the Art Nouveau and Art Deco artists, life should be a Gesamtkunstwerk. 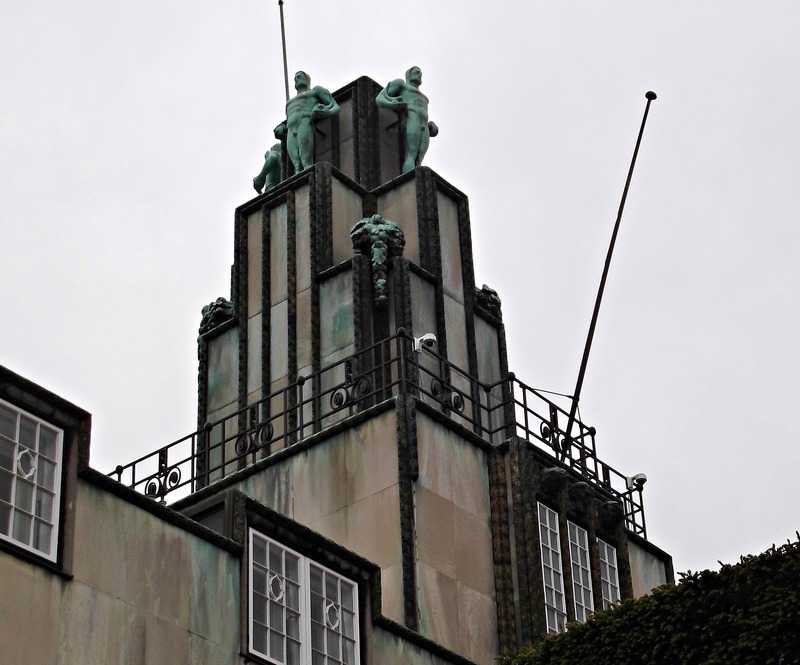 Given that, it was only natural that Josef Hoffmann not only designed the architecture, but also the interior and furnishings of the house. Hoffman’s famous colleague and artist Gustav Klimt created the mosaic friezes. The mansion is still occupied by heirs of the Stoclet family. It is not accessible to the public. Actually, one finds oneself sneaking around the property, trying desperately to take decent photographs through a six-foot fence. But neither the bad weather nor the awkward circumstances could curb my enthusiasm for this building. Private Property. No Trespassing. What a shame! Just in case you want to know how Brussels looks like in beautiful weather, go here. And who in their right mind would want to live inside a UNESCO World Heritage Site? One would think all the tourists and cameras would get on their nerves. As far as I know, it is not inhabited at the moment. The heirs of the Stoclet family are in constant legal battles with each other and the Belgium state about it. A lot of people are very upset that one can’t visit this building, and I’m one of them. I think you did a superb job of capturing this lovely building. I am partial to architectural details and spent a great deal of time looking at the shots of the windows and the gates and the doors – you put me in my happy place 🙂 Well done! Thank you! That means a lot to me because the circumstances of my visit were really bad. The weather was a nightmare, misty and rainy. And then this fence.. I felt like a paparazzo, sticking my arms through the fence to take pictures. Lovelovelove that architecture. I regret that I did not see this place when I visited Brussels. I don’t remember reading about this place in any of our brochures or booklets while we were in Brussels – Maybe because it’s not open to the public. What’s the point of having a UNESCO World Heritage Site if no one can see it. Your photos of the outside are lovely though. I hope that one day we will be able to go inside. It’s really a crying shame that one has to sneak around like that. I read that some parts of the Stoclet family wanted to open it to the public, that’s why they had legal battles with each other. The Belgian state wanted to buy the mansion, but the family wanted an exorbitantly high prize for it. So cool! I had no idea that existed. Really good job with the pictures. Thank you so much for posting! Thank you so much! I was rather concerned how the pictures would look like because of the bad weather. Very, very, very nice pictures! Thank you, I’m happy they turned out acceptable despite the unfortunate circumstances! Impressive gallery and thanks for providing thorough informatuon on the Stoclet Palace…. Athena Sculpture is wonderful, indeed!.